John Clement Favalora was born December 5, 1935 in New Orleans, Louisiana. He studied for the priesthood at St. Joseph Seminary in St. Benedict, Louisiana; Notre Dame Seminary in New Orleans; and the Pontifical Gregorian University in Rome, Italy, where he was ordained on December 20, 1961. 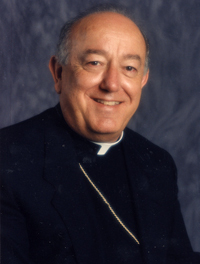 On November 3, 1994 Bishop John Favalora was appointed to succeed retiring Archbishop Edward A. McCarthy, becoming the third Archbishop of Miami. Archbishop Favalora was installed on December 20, 1994, at St. Mary's Cathedral in Miami. Archbishop Favalora has spoken out on behalf of the rights of immigrants, especially Haitians. The Archbishop has and will continue to fight for the rights of Haitians that have arrived on our shorelines to get them Temporary Protective status to stay in our country. The Archbishop was chosen in 1997 as a U.S. delegate to the Synod for America. Many of the initiatives now being taken in the Archdiocese, chief among them the emphasis on missionary activity at the parish and school levels, are in keeping with the recommendation of that synod. Archbishop Favalora initiated the Vision 2000 endowment in 2000 with the goal of raising $75 million to secure the future of the archdiocese. Vision 2000 raised about $108 million in pledges. In the fall of 2006, he promulgated “Fountain of Grace,” a 50-page booklet containing a basic introduction to the teachings of the Catholic Church. The booklet was created at his request, to make sure that anybody engaged in ministry in the archdiocese has a fundamental understanding of the basic tenets of the Catholic faith. “Fountain of Grace” is required reading for anyone seeking to teach, sing, lector, distribute the Eucharist, or engage in any other type of parish service in the Archdiocese of Miami. The Archbishop has written four Pastoral letters; his first two coincided with the beginning and the end of the Jubilee Year 2000 and his last two coincided with the beginning and the end of the Archdiocese’s 50th anniversary celebration in 2008. In his last pastoral letter he wrote brief reflections on the events in the life of the Holy Family and some applications to our present day family life. The Archbishop has supported both St. John Vianney College Seminary and St. Vincent de Paul Regional Seminary by being a strong role model of priestly formation and by attending Mass with the seminarians. In 2009 St. John Vianney College Seminary in Miami celebrated its golden jubilee with a record number of seminarians enrolled.